Photographer Stacy Niedzwiecki at her venue, Peaches Bed & Breakfast with her ArtPrize entry - an image from Ludington on canvas. 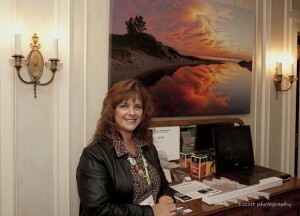 Photographer Stacy Niedzwiecki with her entry, “From the Shores – Edge of Isaac”. A Rockford artist and participant at ArtPrize is among those giving hands-on demonstrations at the venue where her work is displayed. Stacy Niedzwiecki, a graphic designer and photographer, enjoys photographing nature. Niedzwiecki has earned numerous awards for her work and has been published. Niedzwiecki’s third and current entry focuses on her From the Shores collection. The photography collection features “unique, new images captured not only from the Great Lakes but from streams, rivers, inland lakes and may include important flora and fauna naturally found in these locations.” Her ArtPrize entry was taken on Sept. 1 at Ludington State Park. “The unusual cloud formations were a result of the remnants of Hurricane Isaac as the northern edge of the weather system passed over the Great Lakes,” she said. While Niedzwiecki spent an art residency and the summer months concentrating on “seeking unique perspectives and objects discovered literally ‘from the water’s edge’,” she could not resist the image taken in early September as her entry. “The sky was just amazing. I knew it was a short time, but that had to be my entry,” she said of her ArtPrize choice. Niedzwiecki’s work can be purchased at her ArtPrize venue, which is Peaches Bed and Breakfast at 29 Gay Ave. SE, or through her website. The website is www.stacyn.com. Niedzwiecki has spent 25 years in graphic design. She has been a photographer for about eight years focusing on travel, nature and event photography. Her work has been featured in the MI Blue magazine and for such projects as hospital design work. 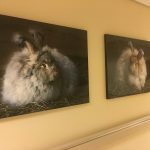 There were 64 of her photographs used at the Lemmen-Holton Cancer Pavilion. “That was really a life changing experience for me,” Niedzwiecki said. 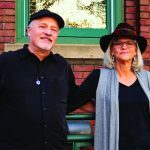 A book was produced based on that work, which was titled Healing Images – A Selection from the Lemmen-Holton Cancer Pavilion. She also was one of 10 artists selected as part of a book that was developed for Pure Michigan. Niedzwiecki was an artist selected for the residency program at ISLAND, which stands for the Institute for Sustainable Living and Natural Design. As part of her time in Bellaire, Niedzwiecki was able to stay in a beautiful log cabin for almost two weeks taking nature photographs. Niedzwiecki said she loves networking and meeting people at ArtPrize as well as sharing in the art experience. The canvas size for her current entry was custom-designed for the space at Peaches. Her artwork hangs in a space that is about four feet by three feet. “It’s had a good public reaction to it,” she said. Her very first entry in ArtPrize was in 2009 and was a series of 18 canvases that featured photography she titled “Michigan Moments” at San Chez Restaurant. Her 2010 entry focused on her adventure and photographs from sailing on the Tall Ships. Great Ships, Great Lakes, Great Concerns consisted of foamcore mounted images attached to a glass block wall at Immanuel Lutheran Church. Niedzwiecki started a website based on that entry and now features an online gallery of about a dozen artists that capture “Michigan Moments.” That website is www.michiganmoments.com. “I started this website for myself and now there are artist images from all over West Michigan,” she said. Niedzwiecki likes her venue this year as she is allowed to sell her work and she loves the hands-on demonstrations Peaches Bed and Breakfast has been doing. “It’s been a lot of fun. This is the best venue for having fun,” Niedzwiecki said. Families can enjoy forging, painting, sculpting, woodworking, welding, photography and more. There also is a BBQ smoker and free refreshments with 26 entries at the location.